The Apple TV software has been updated in a very quiet manner, but the new functionality contained in that update—AirPlay broadcasting, support multiple iTunes account, shared photo streams—is more substantial than it first seems. And the fact that you can now rearrange icons on the home screen suggest that proper support for iOS apps could finally be on the way. I mean, sure, it's just icons on a homescreen. But why would Apple suddenly care about letting you rearrange this stuff unless they were going to open up an Apps infrastructure or deliver an avalanche of updated channels? (And honestly, the former sounds a little more feasible than the latter.) We've seen this functionality in beta builds, and now that this is official, apps support seems all the more likely. And as AirPlay support between iPhone, iPad and Apple TV has ramped up, it has gotten to the point where the Apple TV might as well allow apps. But it makes sense that they wouldn't fully roll out everything right now, since the company traditionally updates its Apple TV hardware in October, and would probably want to save a major software overhaul for that reveal. But these other new features are exciting too. AirPlay will now allow you to broadcast streaming content to other devices. (Think multi-zone control for speakers connected to AirPort Express routers, Macs or AirPlay speakers.) Shared photo streams means that you can view whatever your friends upload to their iCloud (as long as you receive an invite from them). And support for multiple iTunes accounts means that more than one person can easily rent movies or buy music, which is good for those who have roommates. Plus there are a handful of other new features which iDownloadblog discovered and are listed below. Shared Photo Streams – Accept invitations for Shared Photo Streams, browse photos and comments, and receive notifications of new content. AirPlay – Send audio content from Apple TV to AirPlay-enabled speakers and devices (including AirPort Express and other Apple TVs). 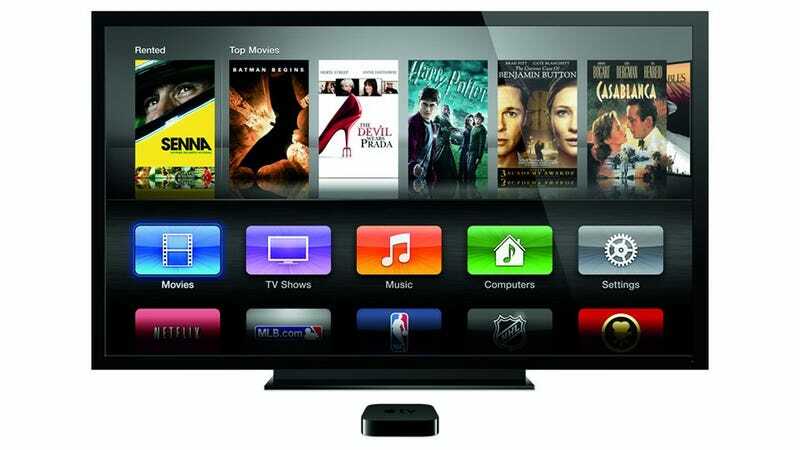 Also includes the ability to require an onscreen code to use AirPlay with your Apple TV. iTunes account switching – Save multiple iTunes accounts and switch quickly between them.